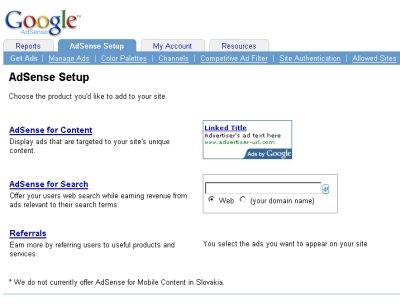 On last post you learned how to register in Google AdSense, I hope that your registration was successful. If yes, you can read this post, and you will learn how to create your first ad for your blog. This it the simplest way, how to do it yourself. 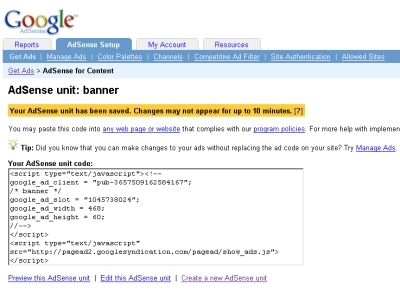 Login to your Google Account and click on AdSense service. 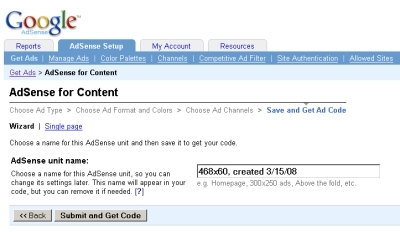 Ther you choose tab AdSense Setup. On first page you can choose from more AdSense format. 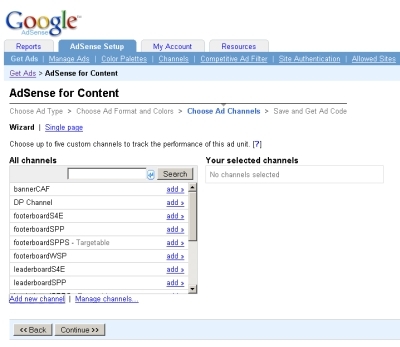 Choose AdSense for Content ads. you have more possibilities, but it is the most used format and you can earn more money from this format than from others. I recommend you to choose on this page option Ad Unit with Text ads only. Then press button Continue >>. On next page you have to choose size of your ad and their colors. 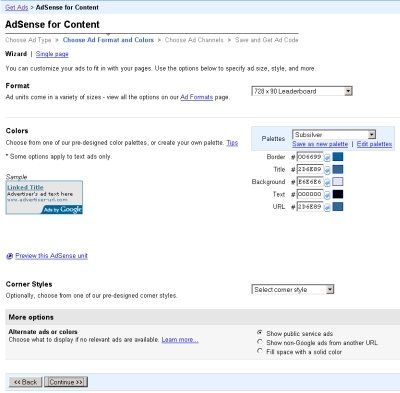 Size of your ad is related on place when you want to add your ad in your blog. It exists some heat map where it is good to place your ad on page. The colors fade from dark orange (strongest performance) to light yellow (weakest performance). As you can see the best place is above your primary content. 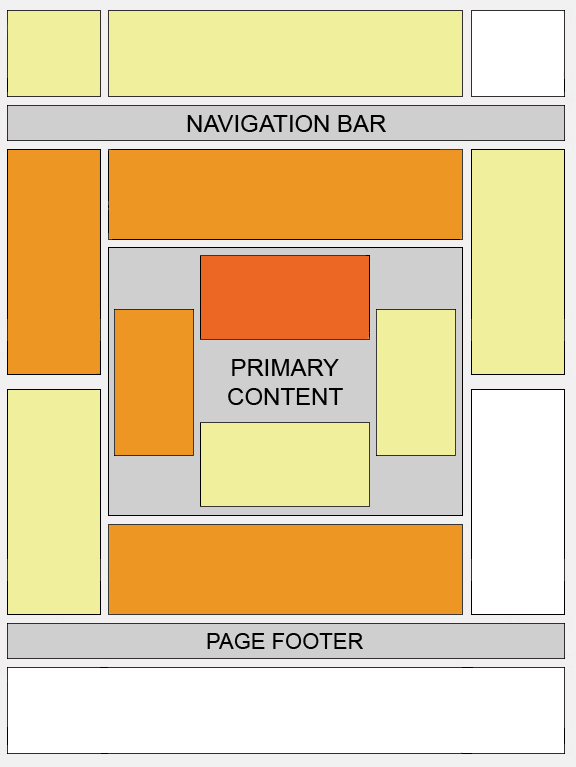 That means to choose format with width equal or near to size of your main content area. Usually it is 486*80 Banner Format or some others horizontal formats. Choose one from them. Now you must do second important thing. Try to hide your ad on your page. This method is called blending. It means try to choose colors that are similar to colors of your primary content. There is also possibility to save chosen color to your own color palette. And also choose corner style like is used in your template. I read good advice, that people like to click on blue colored links. It is good to choose this color for links in your add and also for your template for blog. Press button Continue >>. Now it is time to create channel where you can see your stats for created ad. Press link Add new channel and choose name for you channel. Then press link add >> on right side of your created channel. It will move to right list. Press button Continue >>. Now only choose name for your ad. Later you can change features of your ad from menu Manage Ads. Press button Submit and Get Code. You are on last page now, and you can see your ad code. Select this code in clipboard. How to place this code in your blog, I will show you in next post. You need to change your template, to show ad on your pages. This way is good, because you will see ad on all pages of your blog. 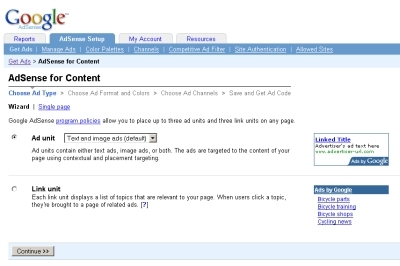 To synchronize ad format with other content on your page. Usually it means set the same color for ads like they are used in other content. If you are recognised as the original publisher of the content though this wouldn’t even happen. To make sure that you get credit for the original work, make sure you only syndicate to websites that not only will give you a byline but will also link to your site. We are looking for software estimation experts. Join, work and earn online. If you have skills, we have online part time job for you. Excellent content – as you always provide and inspires me to come again and again. You are on my RSS reader now. 1. I want to work online ..
2. Many companies all over the world need your opinions on their products. They will send you a simple online survey forms, where you need to fill it out and they pay you money. The most remarkable thing about this paid survey program is that anyone can make money with it. It doesn't require any special skills, training, education or previous business experience. You only need access to the Internet and basic typing skills. It is the perfect home business for stay at home moms, students, home makers, retirees or anyone that is in need of some extra cash.